A while ago, I wrote a piece on what I called the "emerging gentrification" of craft beer. You can find that article here if you're so inclined. At its most basic level, the article looked at what was then happening to craft beer in terms of high-end product. My thoughts in that original piece were mostly based on observation. I'd noticed, for example, that it had gotten pretty easy to find higher priced, $10+ bottles. There was a time not all that long ago when that was not so common. A change was underway. Looking at that same scenario today, more than two years after the fact, it's pretty obvious that the trend is entrenched. It's now commonplace to find $15 bottles and $20 bottles are not unusual. Extrapolating to packaged product, $12 six-packs and $10 four-packs are fairly common. The difference between now and late 2013 is I've seen stats that support what I'm seeing. In simple terms, high-end or premium craft brands are making a greater contribution to overall category growth than they did in the past. And the trend is escalating. What's considered high-end product? Looking through some industry reports, the dividing line is $40. Brands selling for more than $40/case are split into: Premium ($40-$49.99); Superpremium ($50-$59.99); and APEX ($60 and up). Everything below the $40 watermark is considered Craft. This doesn't necessarily translate directly to large bottles, but you get the idea. The growth stats are revealing: While the entirety of the $40+/case segment represents just 20 percent of overall craft volume, that group accounted for 54 percent of year-to-year dollar growth, April 2015-April 2016. Brands in the $40 and under set, which make up 80 percent of total craft sales and have traditionally driven growth, showed negative or flat growth. Taking it a bit further, the 1,000 or so brands that fall into the Premium category saw dollar sales increase 34 percent. We're talking about 12 percent of total craft sales volume accounting for more than a third of growth. Superpremium, representing a smaller number of brands than Premium, was up a shocking 51 percent. 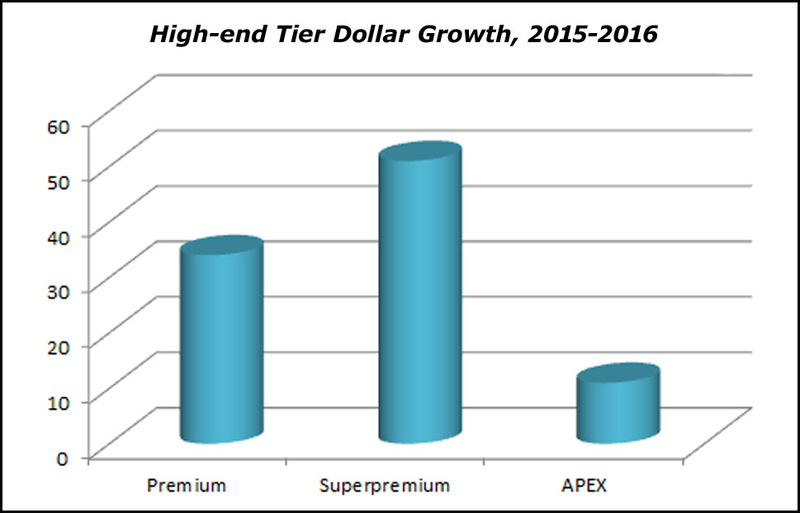 Finally, APEX brands accounted for 11 percent of growth. Some part of this is being driven by the collapse of previously top selling beers in the Craft category. Indeed, Sam Adams Boston Lager, New Belgium Ranger and Sam Adams Seasonal were all hit with double-digit declines during the period in question. And the top 15 bands were down 10 percent, collectively, in dollars. There is that to consider. But you have to balance the decliners with brands that experienced big growth in the base tier. Goose Island IPA, Firestone Walker 805 Blonde and Founders Day IPA all doubled sales. Several brands from Lagunitas and New Glarus also showed solid growth. So the news is not all bad in the under $40/case category. Keep in mind that growth at the top is happening at a time when overall segment growth is slowing. As referenced during the recent Craft Brewers Conference in Philly, craft's dollar share of overall beer is higher than ever at about 21 percent. But year-to-year growth, which was 18 percent during the two previous years, dropped to 13 percent. And the decline appears to be deepening. There are logical explanations for everything. Brewers Association chief economist Bart Watson explained that slowing growth is the "new reality." Why so? Because once you achieve the share that craft has attained, it gets tougher to sustain crazy growth rates. "This is something we need to get used to," Watson said. He's right, of course. If you're going to be worried about some aspect of craft beer, it isn't overall growth. Growing a 21 percent share of the pie by 11 or 12 percent annually ain't half bad. On the other hand, a base that's collapsing in favor of high end product might be reason for concern. A good analogy is a car brand whose sales are increasingly dominated by luxury models. As I see it, part of what's happening is that higher priced specialty beers have turned the industry gaga. Intense competition in the Craft tier means a growing number of brewers are looking to specialty beers to define who they are and make more money per barrel. It's hard to blame them. At the same time, brands in the Craft tier are being largely abandoned or priced upward. A lot of tired, under-performing brands live here. Go to a store, any store, and see how many craft brands sell for less than $10 a six-pack. Not many, if you're excluding sale beer, and likely few that you want. The brands doing well in this tier likely won't be in it for long. It's worth noting that the trend is a team effort. The migration upward is being driven by brewers, distributors, stores, bars, etc. The greater profit per ounce of product moved is one of the unanticipated benefits of the craft beer craze. Everyone is rolling with the punches (and in the dough), refusing to look a gift horse in the mouth and hoping to ride that horse into the sunset. The question is this: Is growth in the high end tier sustainable long-term? I don't think it is. I think there's a limit to how much consumers are willing to pay for supposedly fancy beer. We just don't yet know what the limit is. What's going to drive craft category growth when demand for high end product crashes or significantly declines? I don't have an answer. But the question is worth asking.